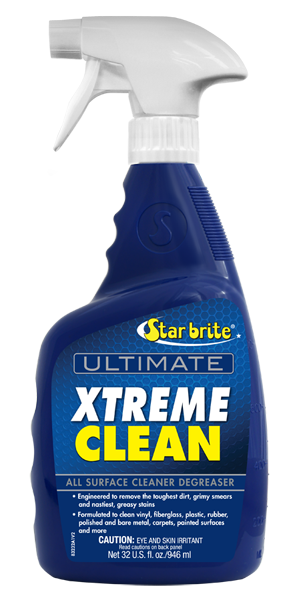 Star brite's ULTIMATE Xtreme Clean is formulated with the latest technology ingredients to be the toughest crud-buster ever. The special chelating agents attack road grime, bug bits, bird deposits, greasy smears and more, breaking the bond that holds them to the surface so they can be wiped away without heavy scrubbing. However, unlike most all-surface cleaners that use cheap, harsh ingredients, Xtreme Clean does not contain caustic, dangerous chemicals that can damage the finish. Xtreme Clean is safe for use on all metal, fiberglass, plastic, chrome, stainless, wrapped, leather and rubber surfaces. Spray area to be treated, then use a sponge, brush or cloth to spread Ultimate Xtreme Clean evenly. Allow to work in for 15-30 seconds before lightly wiping or brushing. Rinse with fresh or salt water. Stubborn stains may require a repeat application that is allowed to soak in for about a minute followed by lightly scrubbing and then rinsing clean. Use wet for washing, dry for dusting.